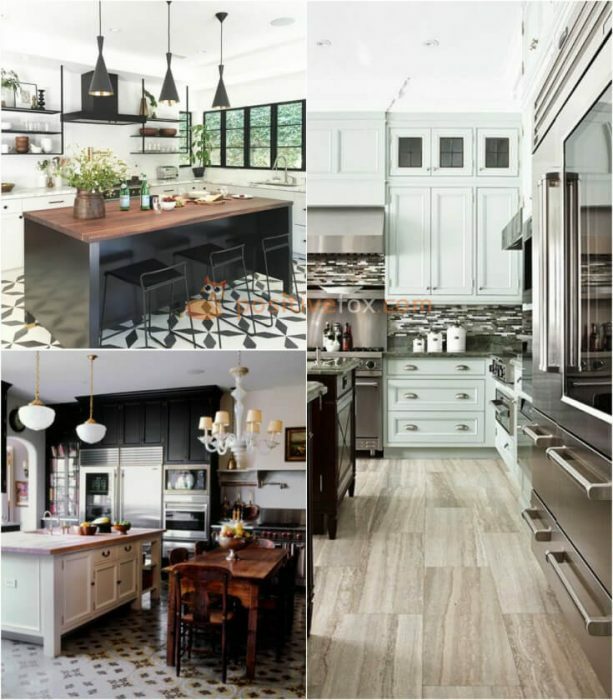 Choosing the right kitchen flooring material is rather difficult. 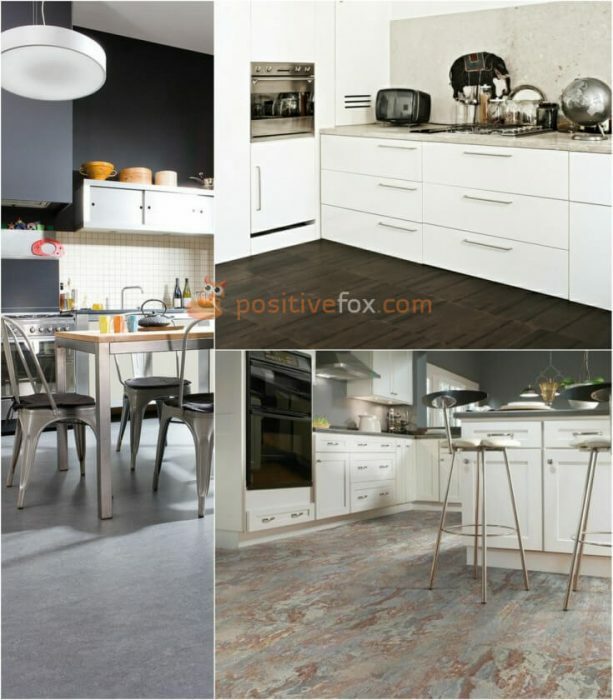 Good flooring material must meet a number of requirements. 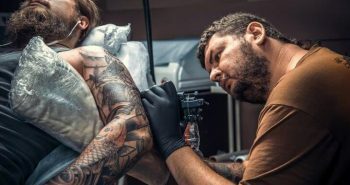 It should be resistant to wear, water and impact. 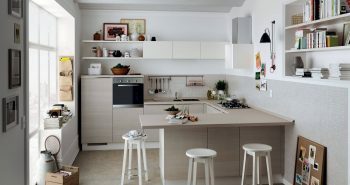 It should also complement the general kitchen design. 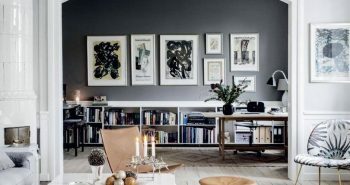 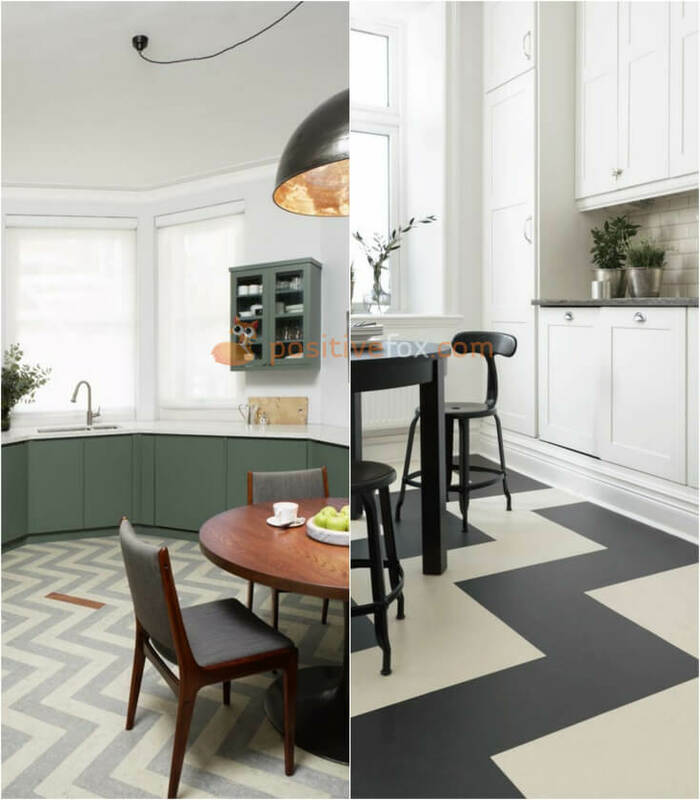 In addition to some of the more common materials, such as wood, linoleum and carpet, other types of materials, that were not previously used, have gained popularity. 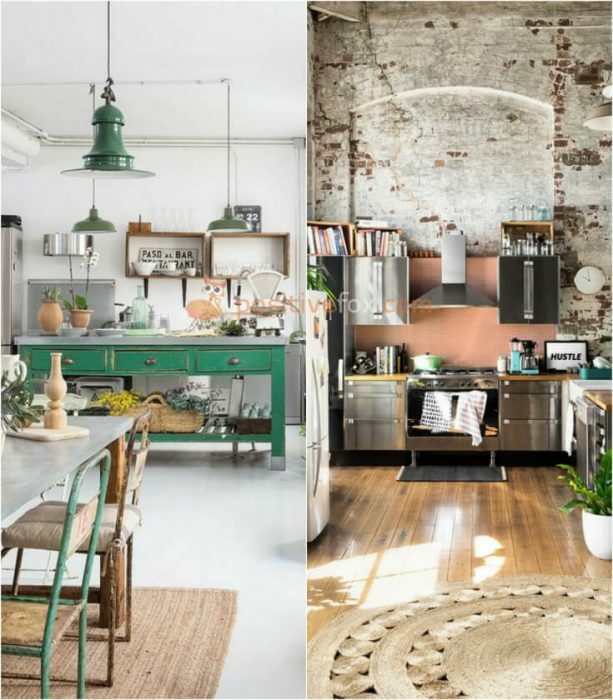 One of them is metal – stainless steel or aluminum. 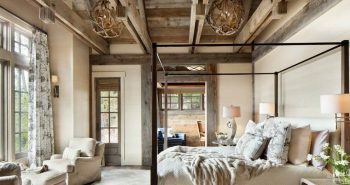 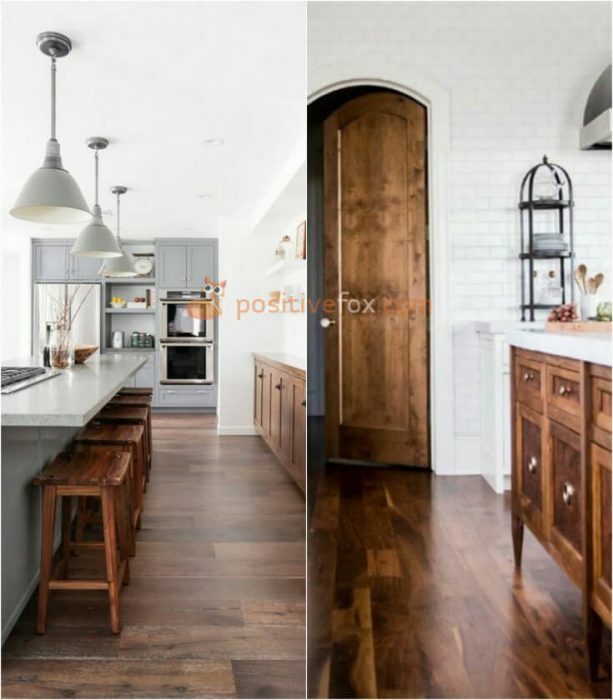 Wood is a traditional, versatile choice for flooring in interior design. 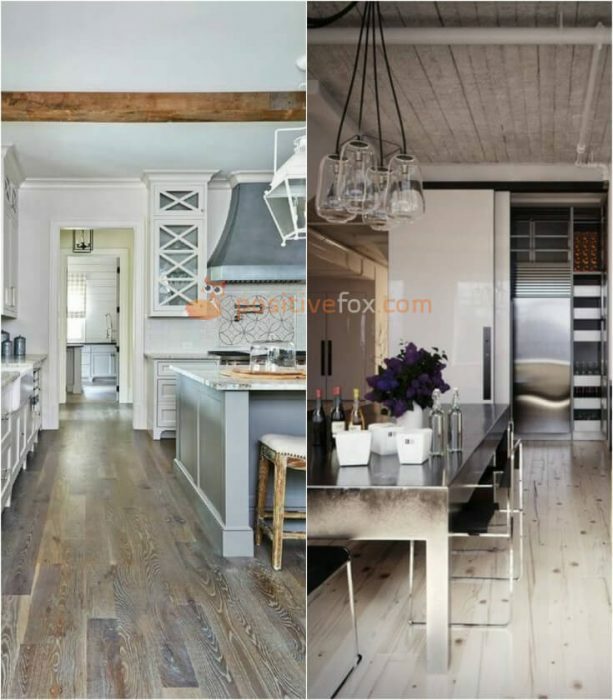 This natural material adds elegance, coziness and stylishness to any interior, and it’s also a great pleasure to walk on barefoot. 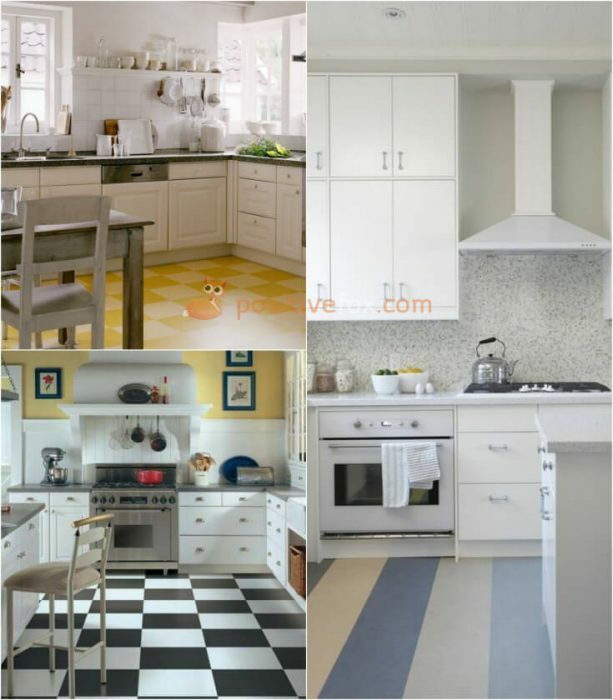 One of the most the most comfortable options for kitchen flooring is carpet. 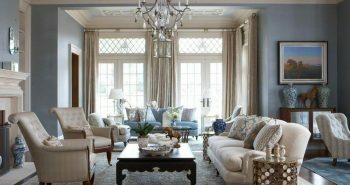 A warm, thick fleecy fabric that is pleasant to the touch. 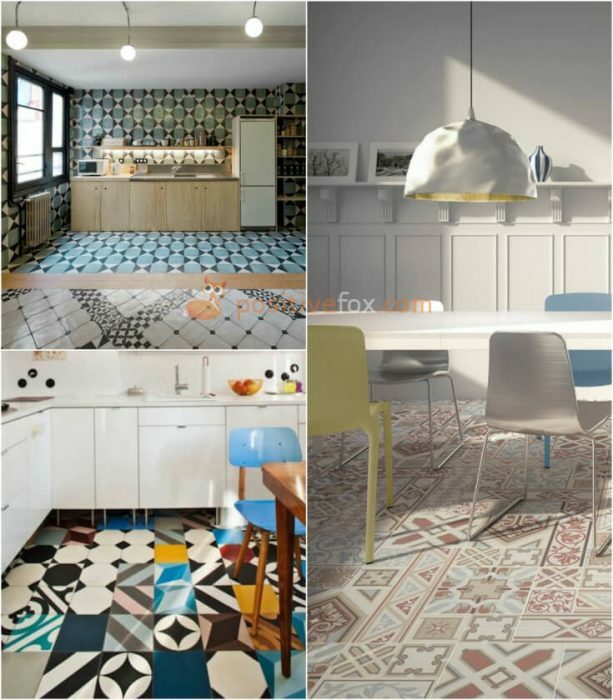 Carpet retains the heat well and provides great traction. 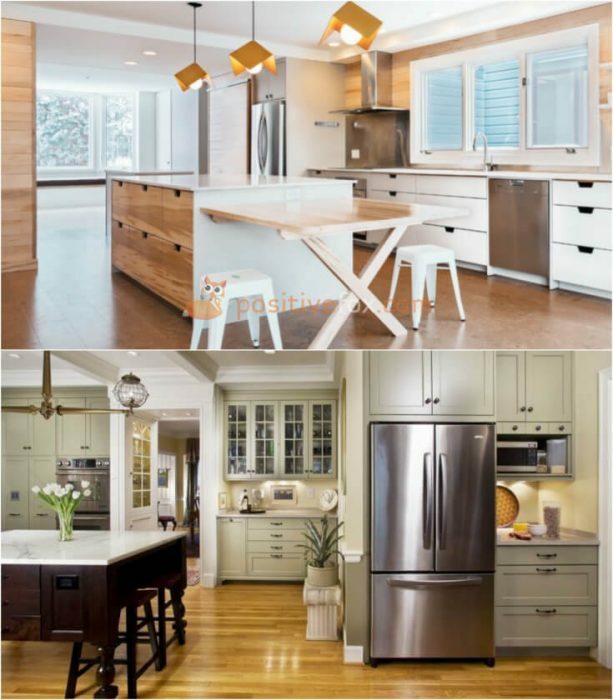 However, not many people choose to use this material in the kitchen for fear that it will accumulate dirt and grime. 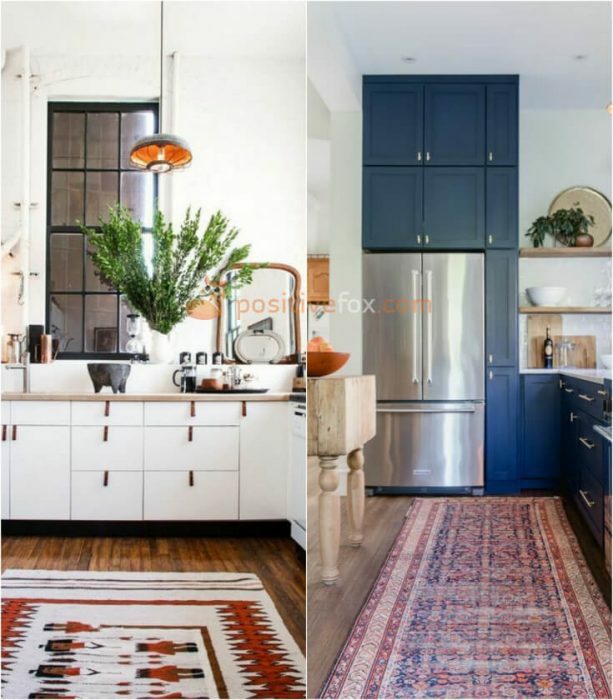 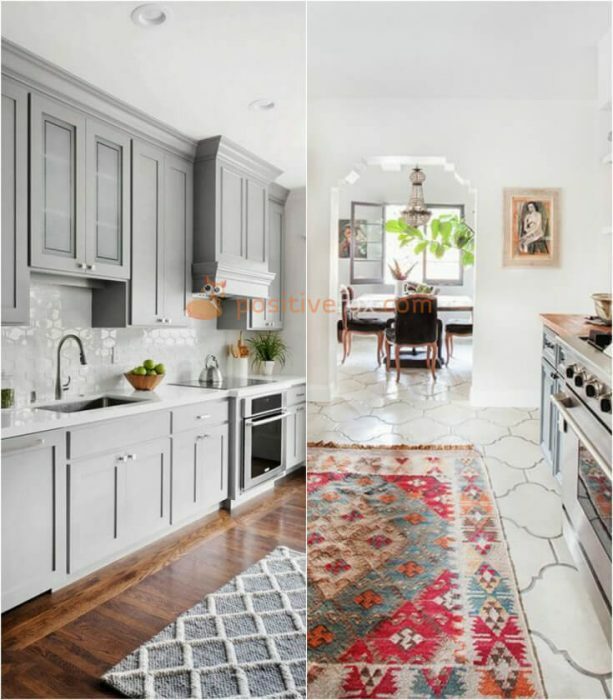 A feasible compromise would be to partially cover the floors with rugs, if the dimensions of your kitchen allow it. 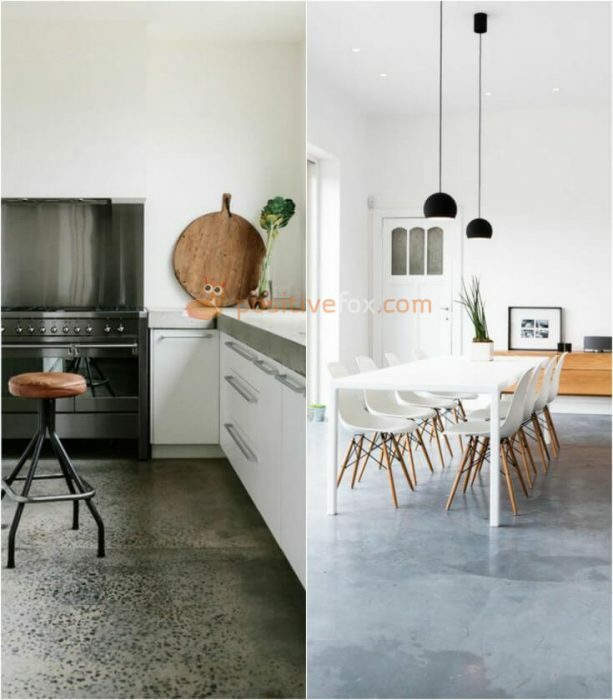 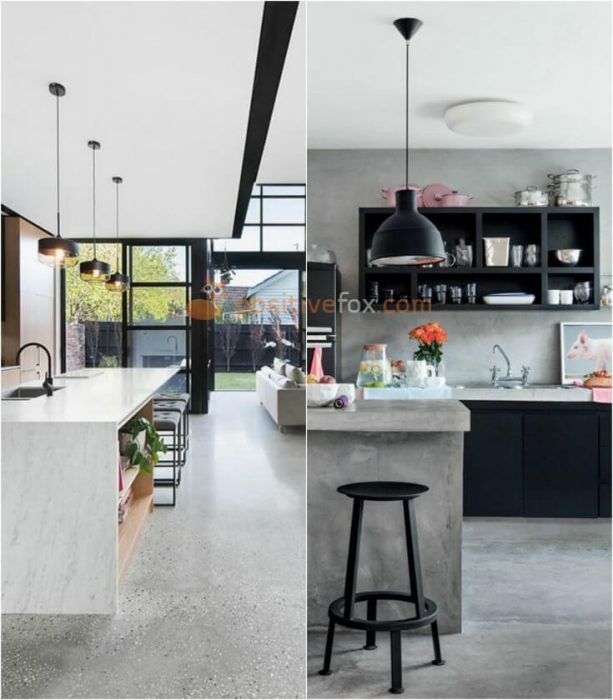 A concrete floor in the kitchen will please those who like modern, minimalist designs. 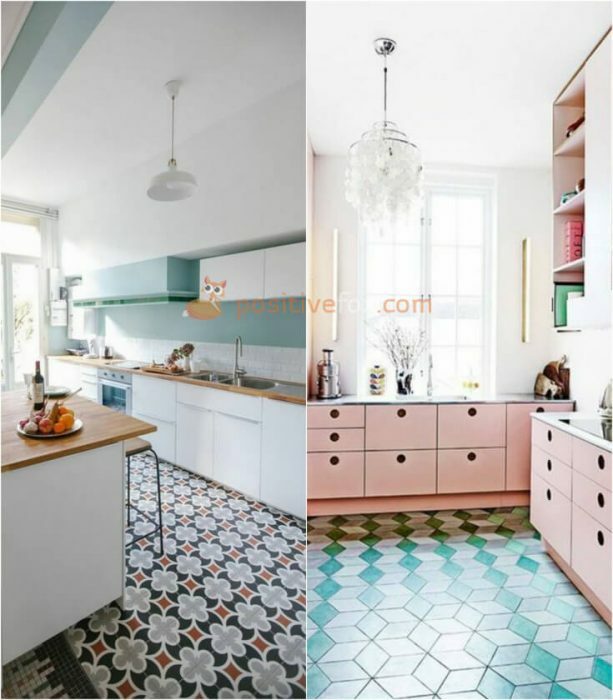 This flooring is a wonderful choice as it does not absorb moisture and can withstand high temperatures and heavy blows from falling pans and other heavy kitchenware. 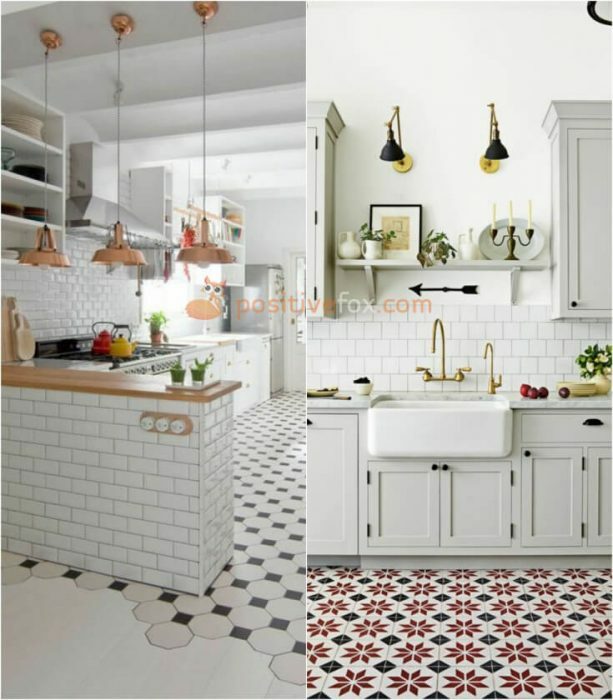 Ceramic tile is among the most popular materials for kitchen flooring. 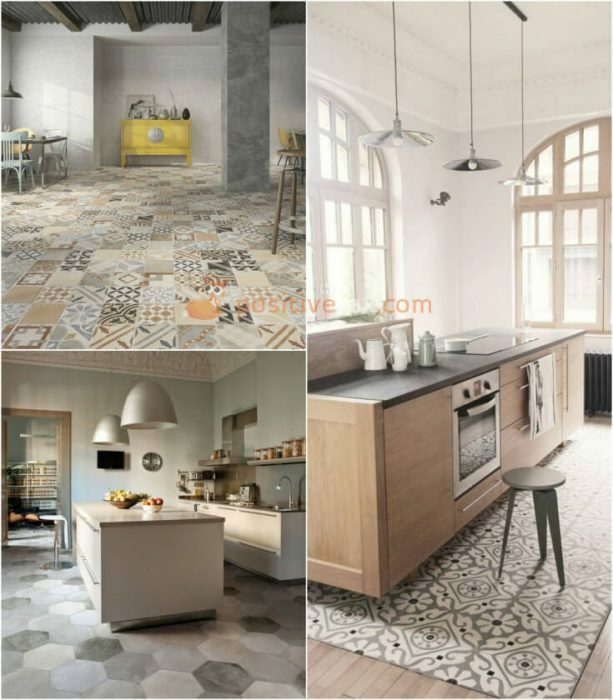 Tiles are durable, wear resistant, and do not require maintenance. 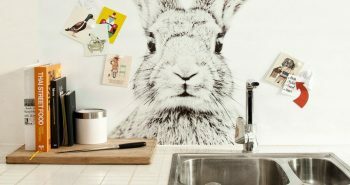 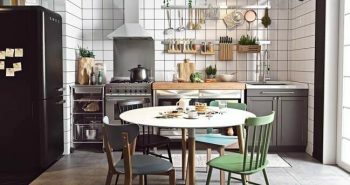 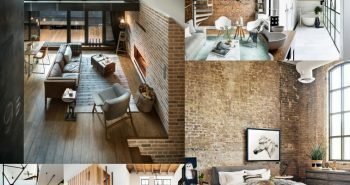 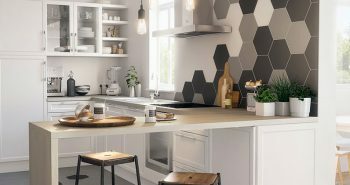 It is possible to make ceramic tiles a stylish addition to your interior as well as being functional and easy to keep in a kitchen. 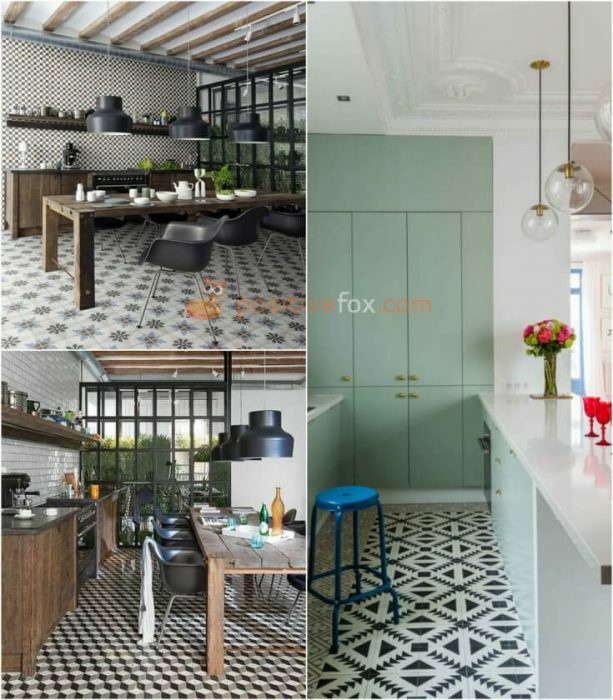 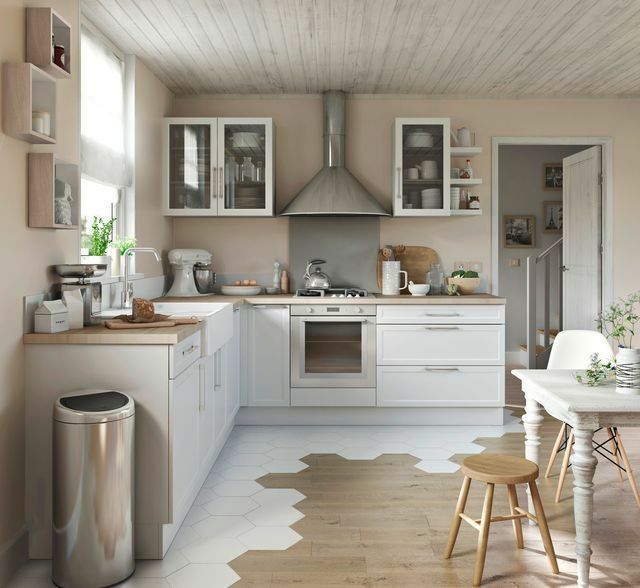 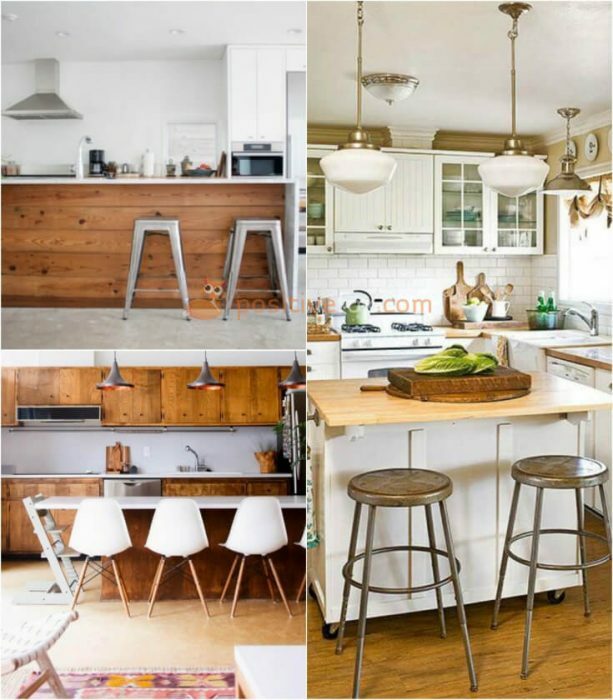 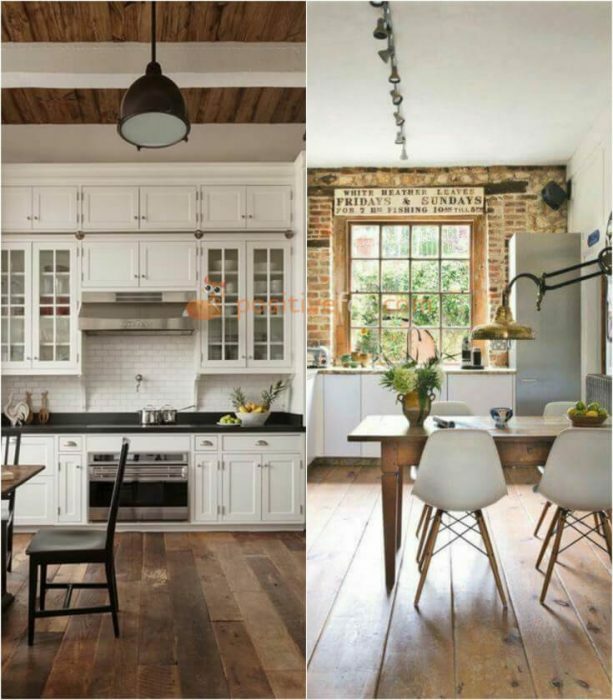 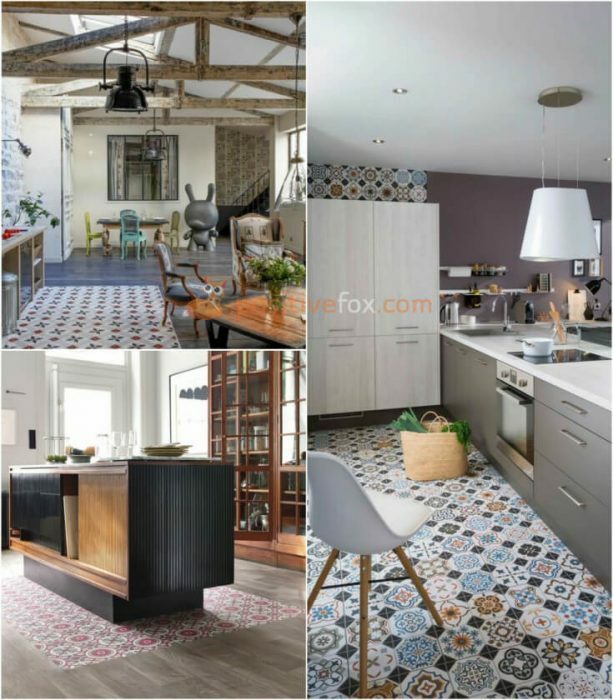 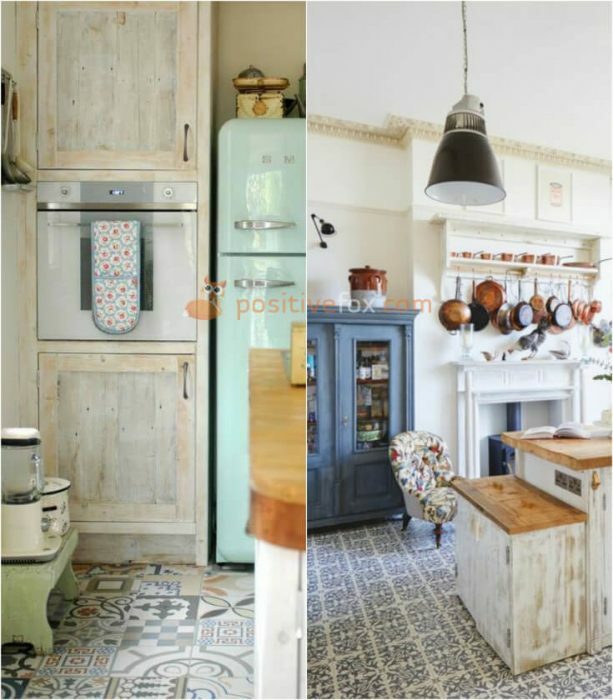 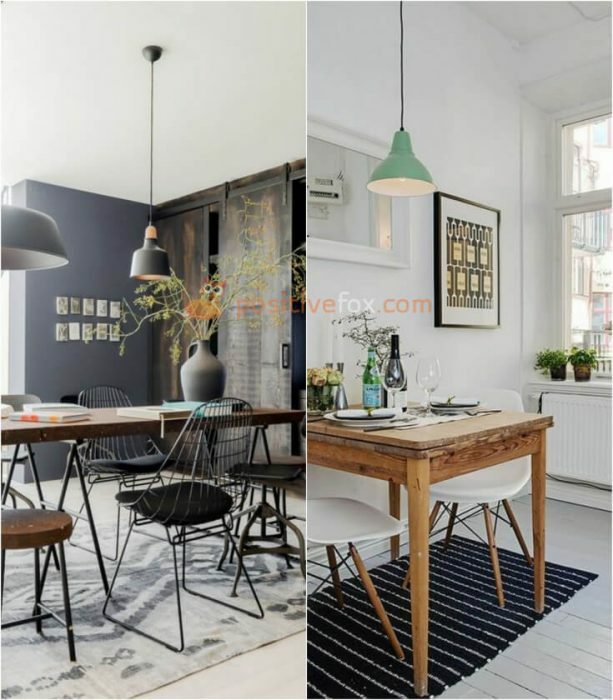 If you want the floor in the kitchen to stand out or become the highlight of the room, you could choose tiles that mimic natural textures, have an obvious structure, or are decorated with an original geometric pattern. 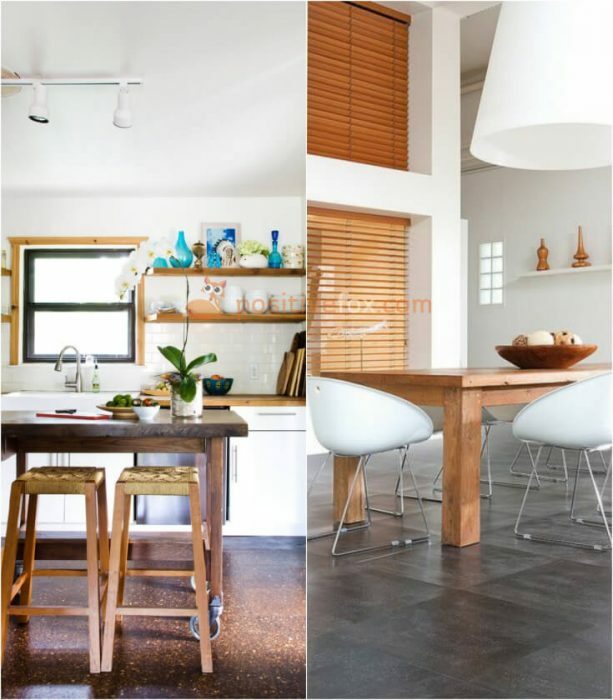 Cork flooring is not only a natural and environmentally friendly floor covering that is made from specially treated cork bark, but it also has a cushioned surface, which is a big plus. 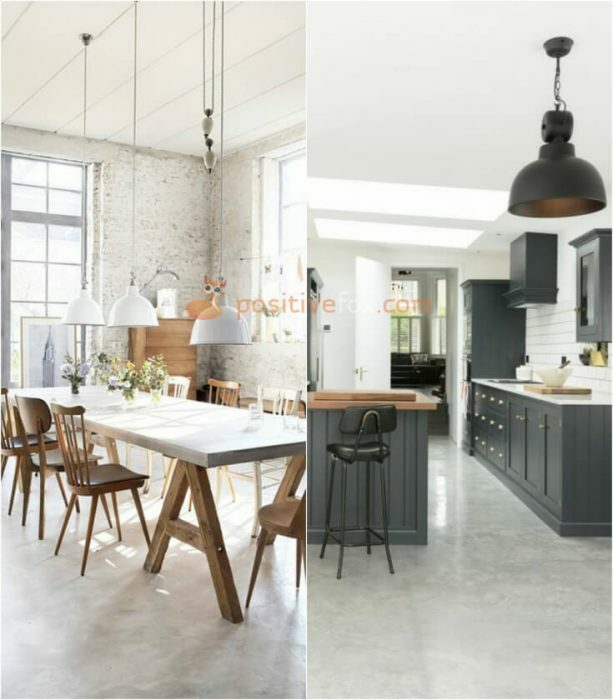 Due to its structure, the material preserves heat, does not absorb moisture or attract fungus or mold. 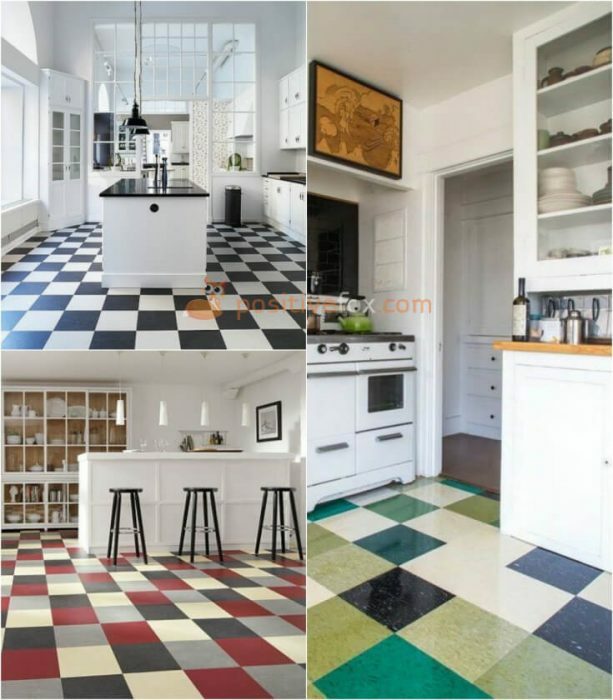 One of the most popular and practical kitchen floor coverings is linoleum. 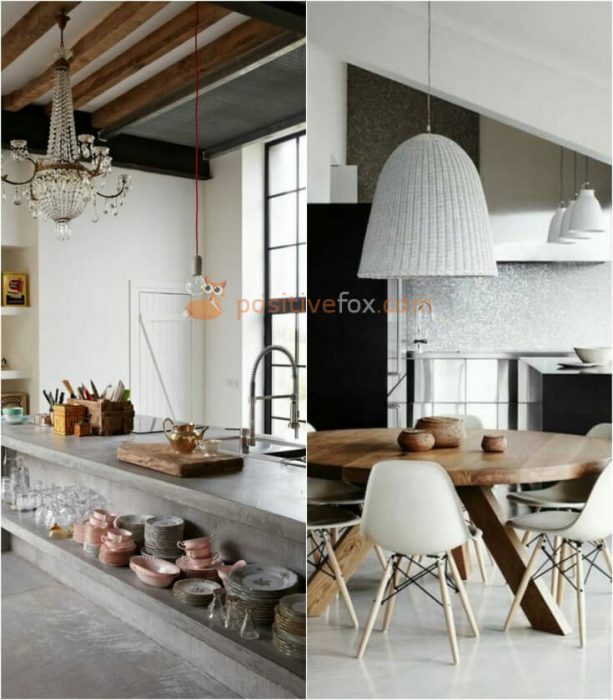 It is resistant to moisture, cleaning agents and heavy objects falling on it. 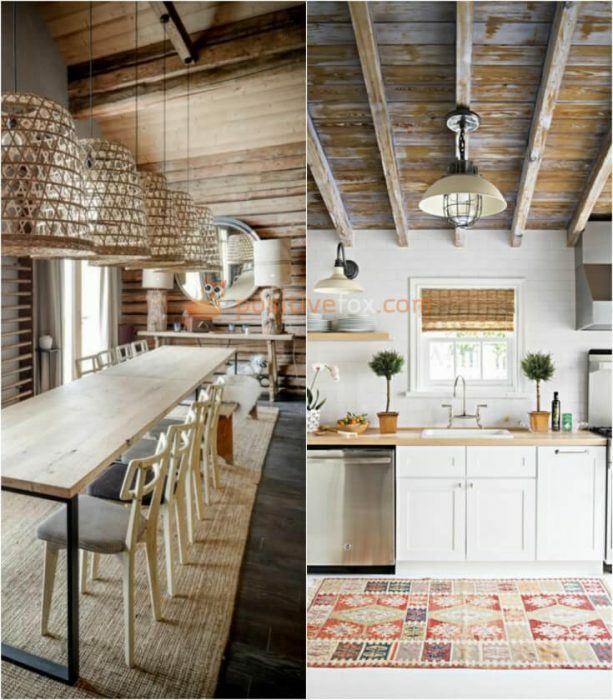 It also provides good sound and heat insulation.